Our 40 ft flat rack sea containers are made of a solid corten steel frame, with a wooden or steel floor, and two sturdy fixed end walls. Flat Racks are ideal for safe and secure transportation of heavy objects that do not require coverage. These 40 ft flat racks allow you to transport larger items, like vehicles and machinery, that cannot be secured on the 20 ft flat rack. 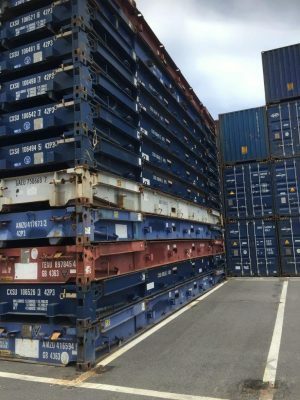 These Australian owned and operated 40 ft flat rack shipping containers are affordable, durable, weatherproof, and guaranteed to last years.